Lots of beautiful things come from Italy. This rack is no exception: sleek and with just the right dimensions. The -2 nomenclature stands for 2-level. There’s also an S5-3, 4 and even 5-level version. The levels are retrofittable which means that you can start with 2 levels and add to that as your system grows. 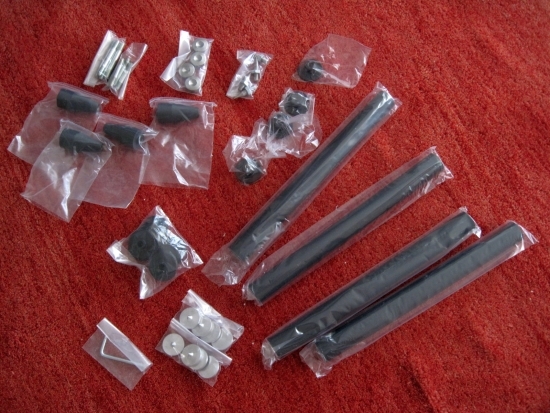 The rack comes in an Ikea-style package, for the user to assemble. All that’s supplied is a hexagonal wrench, which is actually only needed to fine-adjust the spikes from below the levels. Construction is clever and all elements are neatly finished to a high standard. One thing that could have been carried out better is the instruction guide. Being only 2 pages and very basic (also Ikea-level), all isn’t quite clear from the get go. 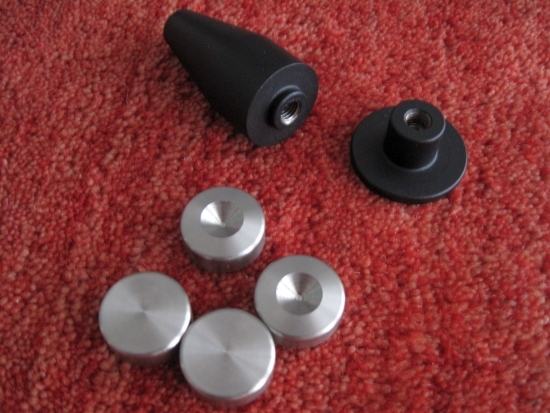 Also, some pitfalls might have been outlined more clearly, for example to make sure that the upper bolts are used in one particular direction. 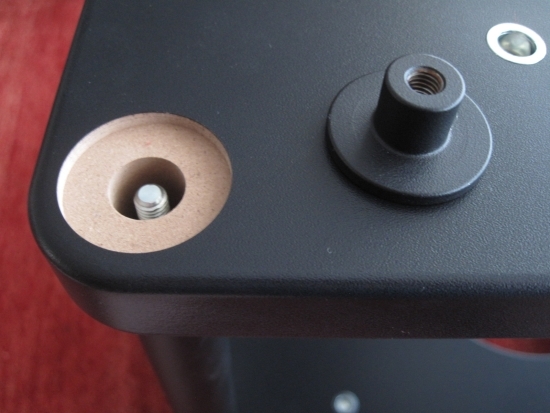 I failed to notice this and got stuck in the last stages of assembly, when the last top screw-plate wouldn’t fit entirely. I tried all kinds of things, including disassembly, adding pieces of paper and extra-firming up the bolt using pliers, until I tried the bolt in reverse. It wasn’t until then that I noticed how the thread is slightly longer on one end. Once assembled the rack is very sturdy and it is easy to set level with the finely threaded main floorspikes and in a second stage taking out any residual wobble by using the extra spikes per level. 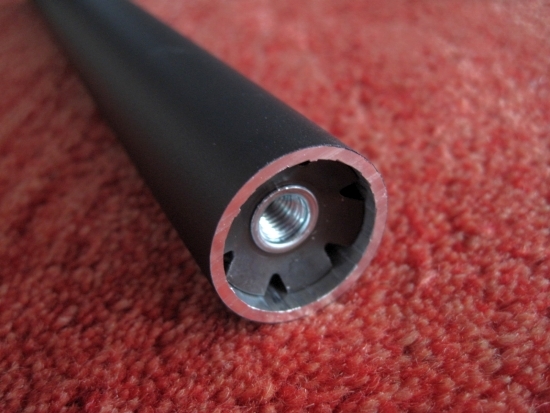 Contrary to what the name suggests, the rack isn’t actually made from Solid Steel. 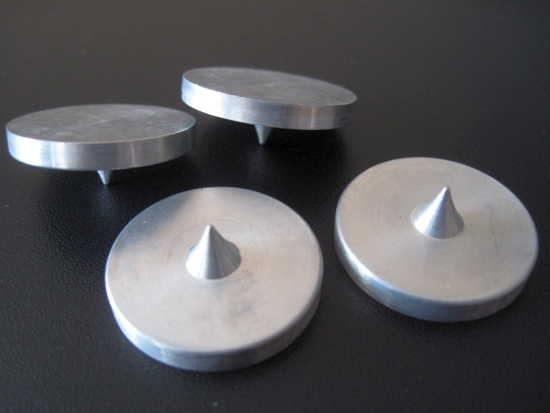 In fact only the spikes, footers, floor discs and top-screw-plates are made from steel. The panels are MDF, sleekly covered in a seamless black, vinyl-like sheeting, like it has been vacuum-sucked over the panel, covering not only the top side but also the sides. The pillars are aluminium, as are the level spikes. 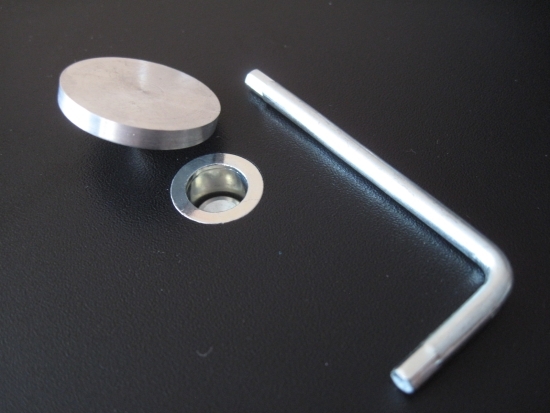 The aluminium pillars are sandwiched between the MDF panels by means of pre-formed plastic washers, then tightened by bolts that connect either to the next level or to the bottom feet or top-screwplates works and this works very effectively. The finished rack has a very sophisticated feel about it: purposeful but not at all bulky. Above: The levels can be individually levelled from the underside by means of a hexagonal wrench. A rack’s contribution to sound is always very much a matter of synergy, and considering the difference in cost, the following comparison is admittedly pretty silly. But it just goes to show that there are indeed large differences in perceived sound, depending on rack choice. 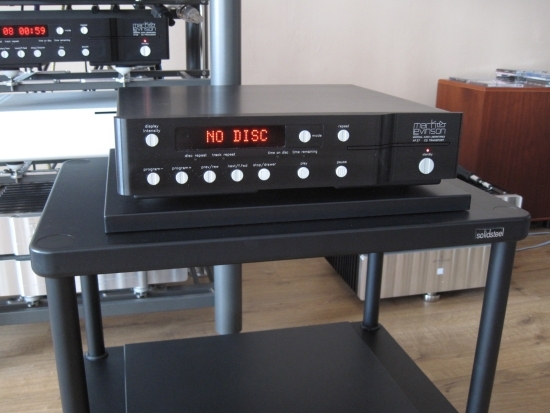 Comparing top levels of my resident rack and the S5, using the Mark Levinson no.390S CD player, the Artesania Exoteryc equipment rack sounds full, smooth and rich, without adding colouration. The latter is most important to me and a large contributing factor to choosing the Artesania after having lived with Finite Elemente Spider racks for over a decade. 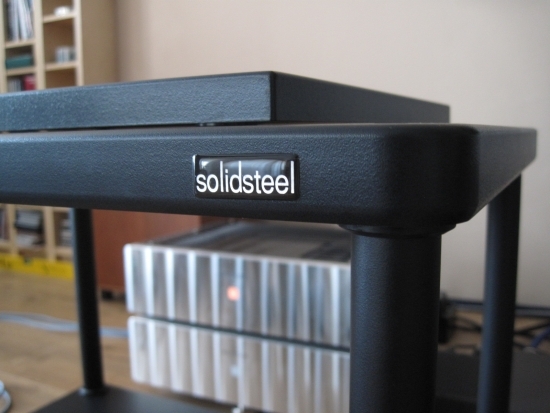 The SolidSteel S5 audiorack by contrast sounds a lot more business-like. Bass is shorter/tighter and a little bit more articulate while maintaining good body, which in itself is good, but the midrange sounds congested and very lean, lacking substance and colour. Upper treble is nicely open but a little dry and the lower part of it is somewhat forward/aggressive. Using my imagination, thus far it seems that I am hearing the positive effects of direct spike-coupling, blurred by up-shifted resonances from the MDF panels. But tonality is one thing and a system can be tweaked and tailored around it. I did the same with the Artesania rack when it replaced the Spider racks. What strikes me most about the SolidSteel rack is the way that it makes music stick to the speakers in a clad-together, cluttered manner, sounding boxy and very coloured, as opposed to an uncoloured, transparent soundstage that flows freely, filling the room with spaciousness. There’s also a lack of focus: the soundstaging is just a bit blurry. 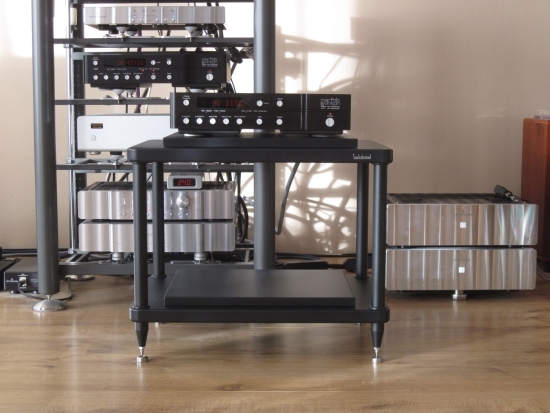 Comparing in hindsight, a Spider rack doesn’t have the Artesania’s richness, or depth of bass, but definitelty doesn’t sound congested nor does it add colouration and it also doesn’t restrict flow or soundstaging. Just to double check, I set up de CD player right on the floor and believe it or not but that sounded a whole lot better. Sure, bass was a little too thick, but there was no colouration, no boxyness and most importantly: no restriction in soundstaging or flow. I know from experience that for solidly coupled racks, the lowest level can sound overly controlled, and the same was true for the Spiders, of which I never very succesfully used their bottom levels. But for completeness, I also positioned the CD player on the S5’s lower level. Imagine my surprise when the S5’s bottom level actually sounded a lot better than its top level! Where the congestion was prohibitive before, it is now reduced to an acceptable level, while bass solidity and overall PRAT improve to a point that makes my foot tap again. Tonality is still on the “wooden” side, but much more tolerable than when using the top level. Seeing as the bottom level rests on solid steel footers, it would seem that the decision to use aluminium for the 4 pillars wasn’t a good one. I would gather that if these pillars were in fact made from solid steel, that the top level might have sounded much better. 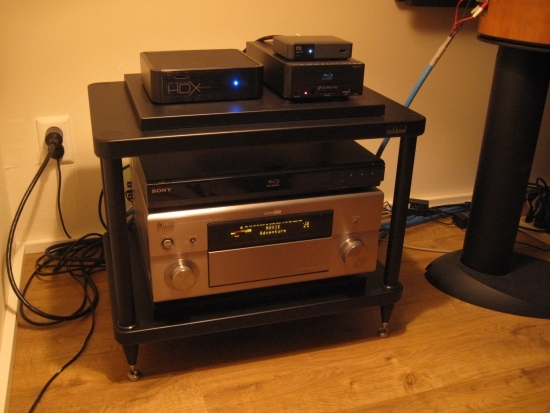 Thus far, the comparison was made using my main audio system but the rack was actually purchased for use in the Yamaha Z7-based cinema part of my system and selected for its appearance alone. I figured that surely it would sound at least as good as my home-made MDF construction (four 18mm MDF panels basically). Substituting my home-made rack for the SolidSteel S5 however, there wasn’t the expected improvement in the bass, in fact, it was the opposite: where before it was nicely deep and full, with the S5 rack it was thinner and less propulsive. Moreover: midrange had become quite forward and less involving, which made me want to turn up the subs some more. 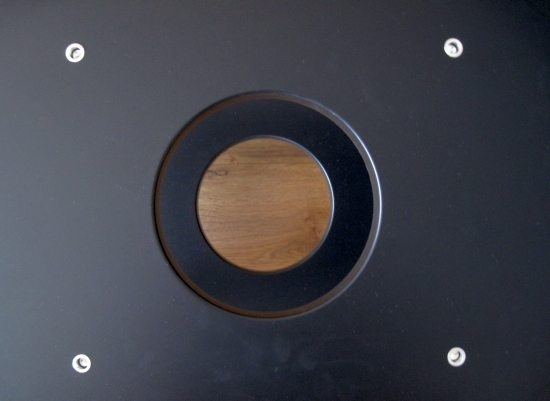 Once again it is important to understand the importance of system synergy and the constraints this puts on judging an audiorack but if a rack like this doesn’t outperform a home-made MDF construction then I cannot help but feel that something’s wrong with its design. 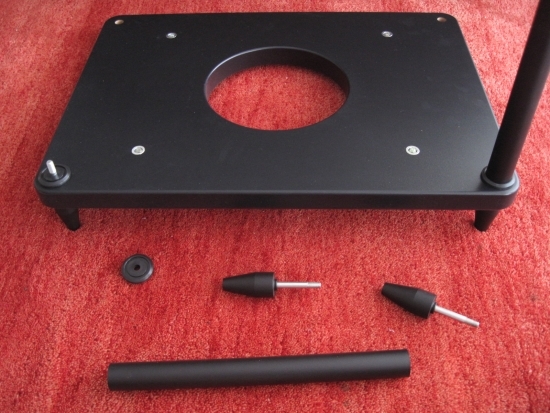 While I realise that some music enthusiasts with find any audiorack to be expensive compared to an Ikea table, 600 euro really isn’t a whole lot for a rack with this level of sophistication. 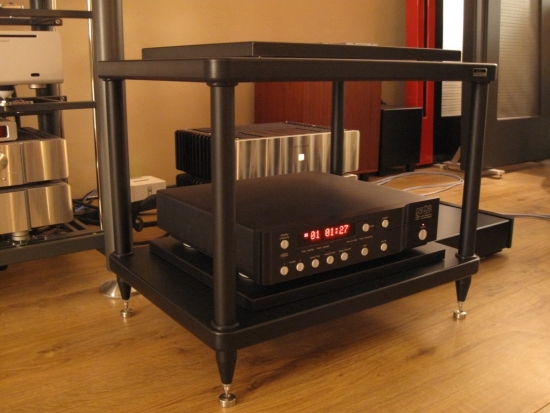 Most audio racks of some fame easily cost close to 1000 euro, so in that regard the S5 looks to be a good deal. Also, some colouration and congestion or resonance (Spider being the exception) will always be present in most racks. So, naturally I did not expect it to sound stellar, nor should it at its price level. In this case however there’s no way around it: no matter how beautiful it looks, sadly, the performance of the S5 doesn’t meet my expectations. 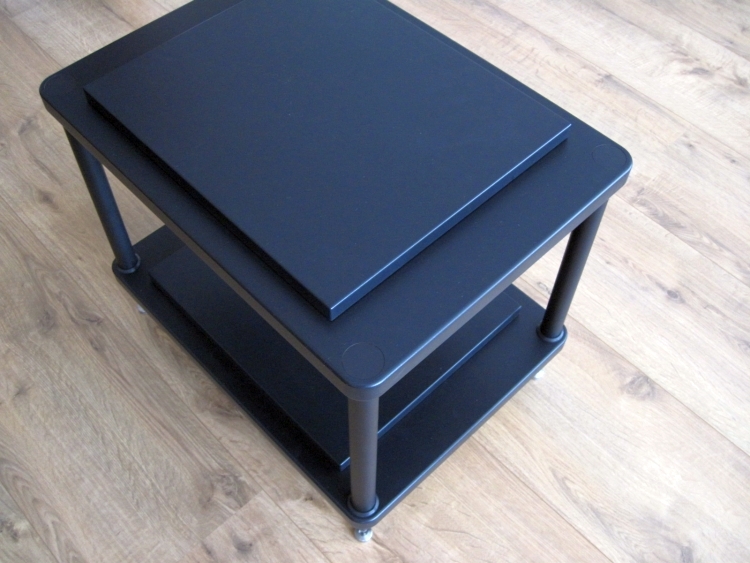 A Spider rack in 30cm, 2-level configuration was priced 660 euro, which is similar to the S5. Even if the Spider used a radical design that wasn’t for everyone, its excellent performance does in a way declassify the S5. Regardless, I will keep the rack, while trying to get the cinema system to sound right by appying various tweaks and swapping cables. And re-calibrating the various Z7 settings. I’m hopeful that I’ll get the sound right in the end. I may be biased toward a certain kind of audiorack, one devoid of obvious colouration of its own, but isn’t that the point of having a dedicated audio rack in the first place? The S5 is built in a clever way and has sophisticated looks. 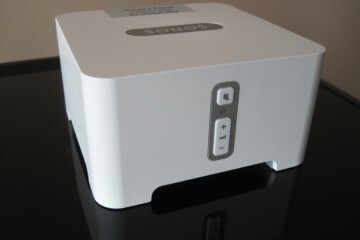 Components placed on it will sound more upbeat and lively, which will be right up the alley of Naim-oriented people. By this I mean that if timing and a rhythmic quality is valued above everything else, this rack might be an excellent choice. However, it tends to harden and flatten the sound in a way that does not complement my system. Knowing what other similarly-priced racks such as Finite Elemente Spider are capable of in terms of enhancing transparency and refinement, I should warn that the S5 rack does not present a uniformly well-working solution.